The late 17th century composer Kerll has written a large body of organ works, many recorded here for the first time by stunning organist and harpsichordist, John O'Donnell. 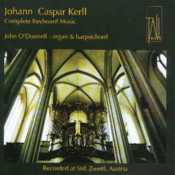 John O'Donnell has used his own edition of this music for this welcome addition to Kerll's sparse discography.… His harpsichord playing, confident but more muted that we generally expect for seventeenth-century German harpsichord music today, emphasises the music's dignity and grace. The rest of the works are played on the wonderful 1731 Egedacher organ of Stift Zwettl, whose choice O'Donnell explains was dictated by its ell-tempered tuning. It is a stunningly beautiful instrument, brighter (and more crisply recorded) than the meantone-tuned 1642 Freundt organ at Klosterneuberg used by Haselböck… His playing of even the showier works is more thoughtful than that of his Austrian colleague. This makes his performance of the Modulatio organica (a massive and serious contrapuntal investigation of the Magificat tones) particularly satisfying. The plainsong versets are sung attractively by O'Donnell's Ensemble Gombert – although the voices. recorded in Melbourne eight months after the organ music, sound a little too close in relation to the organ. International Record Review. November 2000.